I’ve had these boots for years. If fact, I bought the same ones again after wearing through the first pair. They’ve been my go to for hiking the mountains around Seoul, rainy season, and winters in a city that doesn’t believe in salting icy walkways. Not to mention having accompanied me on journeys throughout East Asia. Yet somehow, as I walked through the sandy puddles filled with icy slush at North Avenue Beach in Chicago last weekend, I forgot exactly how far up the waterproofing went. I only realized this as the double pair of socks I was wearing absorbed the torrent of cold water that came spilling in through the laces. It was 25 degrees, at 9am. 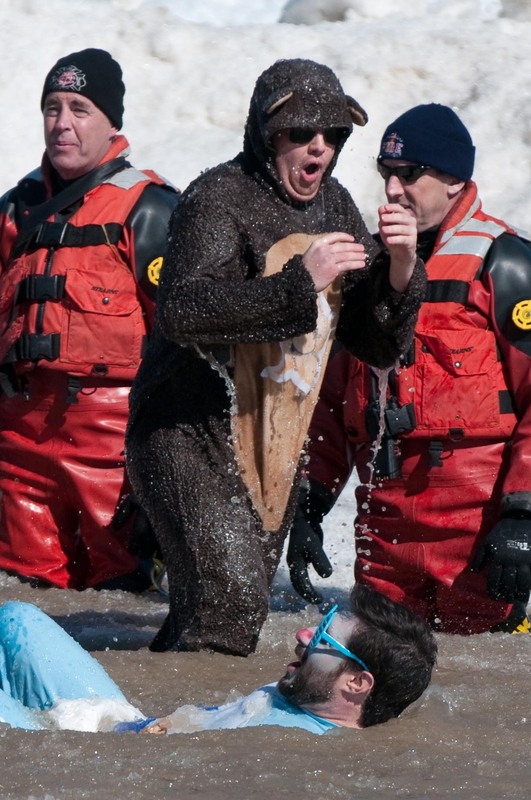 I had arrived early for the Polar Bear Plunge, which was to benefit Special Olympics Chicago. 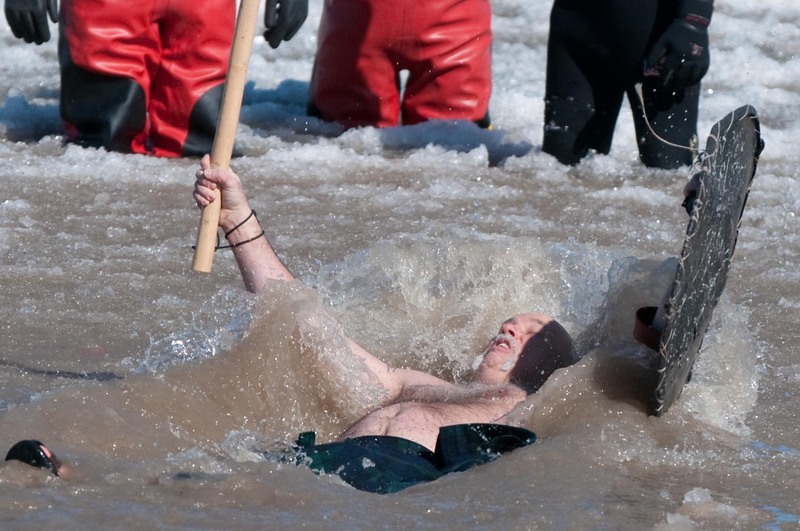 Each year, hundreds of people raise at least $150 dollars each for the chilly honor of jumping into Lake Michigan, in March. My feet still squished in my boots as giant backhoes made a final pass through to remove the larger chunks of floating ice. Fire department rescue swimmers in orange dry suits marched into the knee-deep water at the edge of the ice field in case anyone needed assistance. Fortunately, the only rescues I saw were of errant flip-flops and costume accessories. I realized that even without wet socks, I still would’ve been cold despite all my layers. Just then, the first group, representing ComEd ran screaming down the sand. They were followed at 5 minute intervals by group after group, and people of all ages. I began to wonder what brought these people out here. Some in speedos or bikinis, but many in costumes including a team of Care Bears, Darth Vader, a contingent of brain chomping zombies and an assortment of other heroes, super and otherwise. 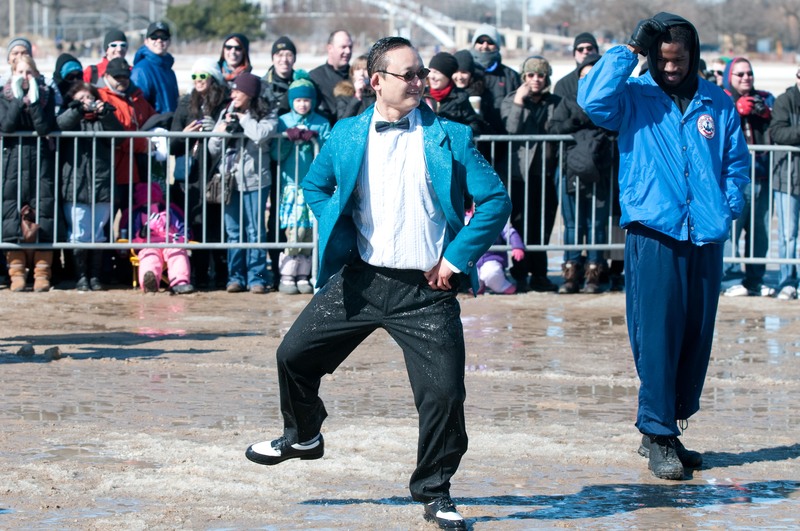 I spoke with one plunger who had lost a bet to his roommate. 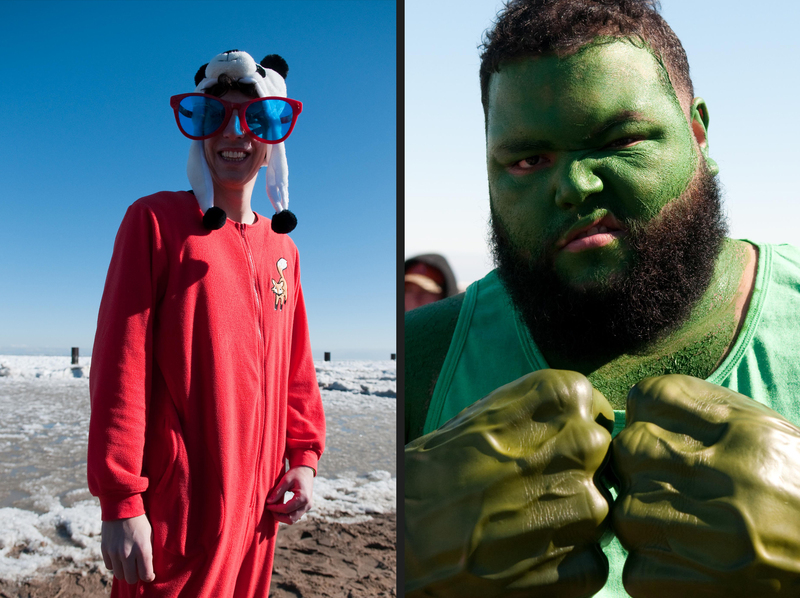 The loser had to compete in the plunge wearing a costume chosen by the winner. The bet? That the Chicago Cubs would have a good season in 2012. The costume which he described as a “Fuzzy Footed Fox” involved a red adult sized onesie and a pair of giant novelty sunglasses. One thing that caught my attention during the event was the participant’s expressions. As they made their way down the sand, many seemed tentatively enthusiastic. Others were sheer bravado. Some wore the most serious expressions, as though bracing themselves for the chill. There were a few who appeared genuinely scared. 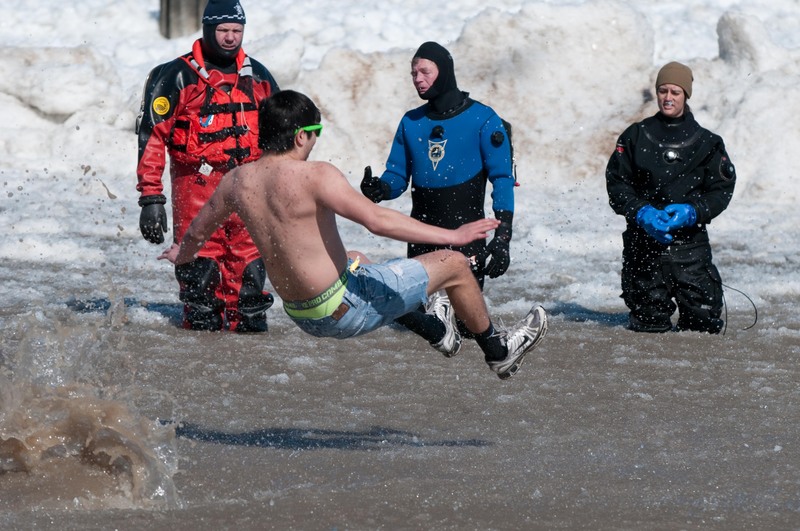 My favorite part was watching those who had jumped into the slush headfirst in the most brave and dramatic fashion emerge moments later stunned and gasping for breath as the water temperature shocked their bodies. Brave faces washed away, now only desiring warmth…and a towel, while I was off to find some dry socks. One of your best in writing style!